Get the speed, security, and scalability of a static site, while still providing a convenient editing interface for content. 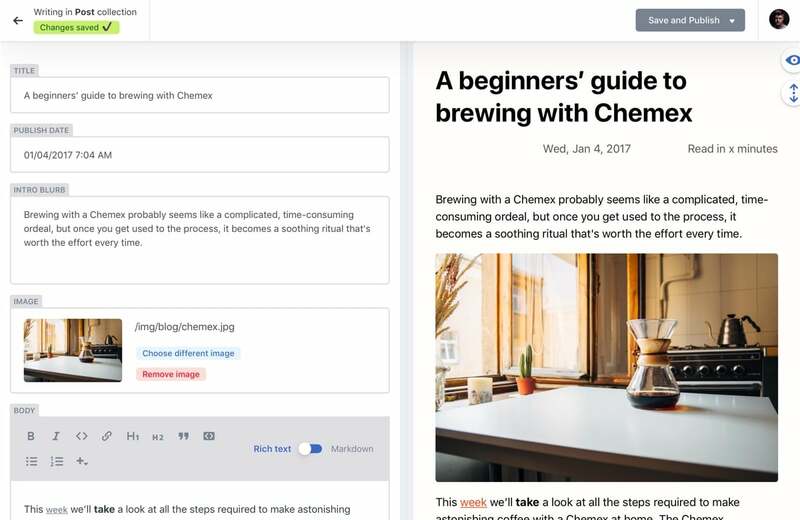 Netlify CMS is built as a single-page React app. Create custom-styled previews, UI widgets, and editor plugins or add backends to support different Git platform APIs. Getting started is simple and free. Choose a template that’s pre-configured with a static site generator and deploys to a global CDN in one click. You get to implement modern front end tools to deliver a faster, safer, and more scalable site. Editors get a friendly UI and intuitive workflow that meets their content management requirements. The web-based app includes rich-text editing, real-time preview, and drag-and-drop media uploads. Writers and editors can easily manage content from draft to review to publish across any number of custom content types. With Git Gateway, you can add CMS access for any team member — even if they don’t have a GitHub account. Get up and running with comprehensive documentation and templates or work through difficult problems with help from the community on Gitter. Netlify CMS is built by a community of more than 100 contributors — and you can help. Join our bi-weekly planning sessions or read the contributing guide to join in.